I'm doing a food themed art show this year...and looking for some more lesson ideas. I have some ready to go, but would like to have a variety of work to select from. Share your lessons & artist inspirations with me!! check out David Gilhooly's funny frog sandwiches in clay. also surreal foods, like spaghetti with eyeballs or "crab cakes" (cake styled to look like a crab). This week my third grade classes looked at Claes Oldenburg. Then we made giant french fries and put them in giant french fry boxes. Fries are simple fold-and-glue rectangular prisms made out of yellow paper or poster board. How about Claes Oldenburg paper mache?? I have a few lessons because we had a food themed summer camp a few years ago. Good luck – can’t wait to see what you come up with! Pop art clay cupcakes or burgers. Huge hit. These are great ideas! Thanks everyone. We only do 2-d for the art show....because I'm going to be displaying almost 600 pieces of art...and really have next to no display cases. I am sure you already have this idea because it is obvious, Wayne Thiebaund cakes. My 4th grade used oil pastels to create 2d cakes from drawn cylinders. We also made clay cupcakes and 2d ice cream cones using tints. They were very "cute" sweet treats"
Other ideas: Artist Arcimboldo for food portraits or landscapes, natural science observational drawings of fruits or veggies including learning their Latin names, a lesson that combines perceived ideas versus observational ideas (the lesson I have is for a plate of cookies where students first draw what they think a plate of cookies would look like then draw from observation and compare the results), a kindergarten drawing lesson where the kids draw veggies growing above and below ground, a lesson that incorporates antique produce boxes/signs might be fun, or I've done a color-theory ice cream scoop lesson with kindergarten -- the students paint 6 circles using color mixing to get red, yellow, orange, green, blue and purple then they put these on a cut-out triangle cone that can be textured with a texture rubbing to make a 6-scoop cone that follows the order on the color wheel, next they trace and cut out a hand to hold the cone, all of this is glued down onto a long sheet of paper. 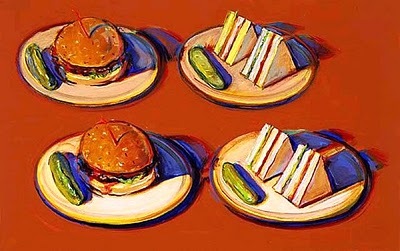 Claes Oldenburg soft sculptures- sewing "pillows" that are shaped and painted to look like foods. 1) Each child had to bring in fruit or vegetables. (We ate the snacks at the end)! 2) I printed a colorful handout on food photography tips with photos which I gave out to the class. 3) We looked at examples from recipes on the Food Network, commercials, etc, and talked about food photographers and stylists. 4) I talked about COMPOSITION--how things are arranged, etc. 5) Each child got to arrange their food (they shared each others to create interesting compositions). I brought in some white plates and bowls and used natural burlap as a background. 6) each child shot 2 photos. 7) As a bonus at the end, I also brought in an egg, which one student cracked and another student shot as the yolk went into the bowl...and I also brought in mini pancakes with syrup which one student poured over the pancakes and another shot as it dripped down over them. I would LOVE to send you the photos, if you would like to see them. The kids had a blast and they did funny things too, such as "fruit faces" and "vegetable animals." We displayed the work on black velvet pinboards and it was a huge hit! This is a way-cool post from a Barcelona art room....they made a hansel and gretl house....look at the sweets - they are NOT real! I used food to make prints (such as apples and pears), but then my students starting adding faces to them instead of the "seeds" I had intended. It immediately made me think of the veggie faces from "How Are You Peeling? Foods With Moods" such a cute book! Besides the awesome 3d projects the book could inspire, you could do a series of 6 prints on a page (6 apples?) and have them draw different expressions on each apple "face" FUN! You could do Gyodan, Japanese fake food, I do it with model magic and paint with watercolor...glue food to a paper chinet plate and make placement..kids love! I went to a workshop at the beginning of the school year where we sculpted toilet paper food. I am doing it with my art club and 5th graders right now and its working great! Check out my blog for pics and more description. I do a pop art unit with my 3rd grade. We end with pop art food clay. Last year I did all pissa slices and pieced them together for a display in the art show. I put out a red and white cafe table cloth- looked really cute. The slight variation of shape and sizes in teh pizza slices made it really cool looking.